High tunnel (hoop house) production of vegetables has become quite common in Kansas. High tunnels protect crops from harsh environmental conditions that can lead to wind and storm damage. In addition, high tunnels provide an excellent system for hybrid bell pepper production in regards to planting date, soil temperature, crop height, etc. Therefore, this system protects the crop, lengthens the growing season, and therefore increasing economic impact for the grower (Carey et at, 2009). Bell peppers in Kansas are a valuable commodity that is sold through farmers markets, CSA’s, on-farm sales, wholesale markets and restaurant sales. Results from a grower survey conducted by the Kansas Rural Center in 2015, peppers are ranked 3rd in specialty crops grown in Kansas. As for growing in high tunnels, peppers are ranked the 5th most popular crop grown in the central United States (Knewton et at, 2010). Our goal of this study was to investigate the performance of ten hybrid bell pepper (green to red) varieties for fresh-market production in high tunnels. We conducted a variety trial of bell peppers grown in a high tunnel to determine which cultivar is best suited for hoop house cultivation in the central United States. Ten commercially available varieties were tested and yields ranged from 7.2 to 12.2 lbs of total fruit per plant. The three varieties with the highest marketable fruit number per plant were ‘Archimedes’, ‘Currier’, and ‘Karisma’. These varieties also had the highest marketable fruit weight per plant and had similar rankings. ‘Archimedes’ was not statistically different from ‘Currier’ and ‘Karisma’ (P<0.05) in all categories in the 2016 season. The trial was conducted at the Olathe Horticulture Research and Extension Center located approximately 30 miles southwest of Kansas City. Transplants were grown in soilless potting media using 50-cell propagation trays. Seeds were sown on 29 February 2016 and transplanted to 50-cell trays on 14 March. Transplants were set on 27 April and the trial was centrally-located in one bay of a multi-bay high tunnel (96’ x 200’ Haygrove Multibay High Tunnel). The trial was planted into four rows with each row consisting of one replication. A randomized complete block design was utilized with four replications. The high tunnel trial contained six plants per plot and in-row spacing was 18”, which is typical of commercial pepper production. Plastic mulch and drip irrigation were employed and the stake-and-weave method was utilized to trellis the plants vertically. Fertigation was carried out at a rate of 10 lbs nitrogen/acre per application on 29 April, 1 June and 30 June and 1 August. Potassium nitrate was used for the first and third fertigation events and calcium nitrate was used for the second and fourth fertigation. Harvesting was carried out from 22 June until 11 October. During the last harvest, all fruit larger than 5 cm were picked and seconds were counted and weighed separately. Fruit were graded for marketability and fruit number and weight were recorded. Average fruit size and percent marketability were determined and are presented below. All data were analyzed using ANOVA (PlotIt, Scientific Programming Enterprises, Haslett, MI), and a mean separation test was carried out by using an F-protected least significant difference (LSD) test. A separate analysis was carried out for each individual observation and the results of the LSD test are shown where statistically significant treatment effects occurred. Table 1. 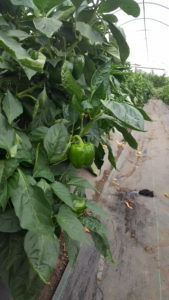 Marketable and total per plant fruit yield of green pepper varieties grown in a three-season high tunnel in Olathe, Kansas. In our trial, ‘Archimedes’ had the highest marketable fruit number at 41.8 and marketable yield at 12.2lb per plant. This variety also had the highest percentage marketability in number and weight at 91.2% and 87.6% respectively. As for marketable number, ‘Currier’, ‘Karisma’, ‘Red Knight’, ‘Declaration’ and ‘Alliance’ were statistically similar to ‘Archimedes’ (P<0.05). In particular, ‘Currier’ and ‘Karisma’ have had consistently higher results in our variety trials since 2013 by finishing in the top half in all categories (data not shown). As for marketable weight, ‘Karisma’ and ‘Currier’ finished second and third with 11.43lb and 11.07lb per plant respectively. ‘Vanguard’ had the largest average marketable fruit size at .32lb and largest average total fruit size at .30lb. This variety has been consistent since 2013 finishing as one of the top four varieties for average fruit size (data not shown). A large portion (>80%) of the fruit quality problems seen in this trial were the result of blossom end rot (BER). Although the cull fruit were not graded specifically for this issue, the results seen in this study were most likely the result of a lower incidence of BER. There were two large flushes during the season. An early flush on 22 July and a later flush on 21 September. There were two other peaks during the season, but they produced lower yield. During the early peak harvest on 22 July, ‘Archimedes’, ‘Currier’, ‘Karisma’ and ‘Red Knight’ produced the highest yields and on 21 September, ‘Karisma’, ‘Archimedes’, ‘Currier’ and ‘Vanguard’ produced the most fruit (data not shown). Market demand timing may determine which variety may be ideal for certain growers. If a grower is targeting an earlier season customer base, then ‘Archimedes’, ‘Currier’ and ‘Karisma’ may work best. However, if market demand is later in the season, then ‘Karisma’, ‘Archimedes’ and ‘Currier’ are ideal varieties. We would like to sincerely thank the Kansas Vegetable Growers Association for support of this project. Seeds were donated by Harris Moran, Seedway, and Johnny’s Selected Seeds. Technical support provided by Paul Andersen, Vaughn Goodloe, Lily Kaufman, Stephanie Gruetze, Tracy Oelschlaeger. We also thank the Olathe Horticulture Research and Extension Center for assistance with this project. Carey, E.E., L. Jett, W.J. Lamont, T.T. Nennich, M.D. Orzolek, and K.A. Williams.2009. Horticultural crop production in high tunnels in the United States: A snapshot. HortTechnology 19:37–43. Knewtson, S.J.B, Cary, E.E., Kirkham, M.B. 2010. Management Practices of Growers Using High Tunnels in the Central Great Plains of the United States. HortTechnology 20:639-645.